Samsung has failed to secure a iPhone ban in Japan in its latest patent fight with Apple. 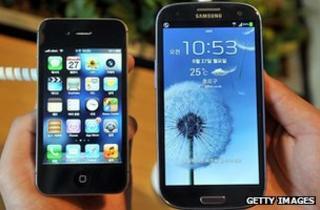 The Galaxy smartphone maker had claimed Apple had infringed the rights to one of its 3G technologies. The South Korean firm has pursued dozens of claims against its rival in courts across the globe, but has only succeeded in a minority of the cases. It coincides with news that Samsung's lawyers are being aided in a separate case by a former London-based judge. At the Court of Appeal last year Sir Robin Jacob and two other judges reviewed an earlier ruling which had ordered Apple to publish a notice in UK newspapers and on its website saying that Samsung had not infringed its design rights. The panel upheld the original judgement and then later supported Samsung's follow-up complaint that the way Apple phrased its notice was "misleading", instructing the firm to rewrite it. "I hope that the lack of integrity involved in this incident is entirely atypical of Apple," Sir Robin wrote in his judgement. Sir Robin - who is also a law professor at University College London (UCL) - is now acting as a consultant to a law firm helping Samsung defend itself against a patent infringement complaint filed in the US by network equipment provider Ericsson. After news of this spread his clerk, John Call, issued a statement. "Sir Robin had not discussed any role as an expert, or any related matter, with Samsung or any of its representatives either directly or indirectly before 9 January 2013, when he was approached through his clerk by Bristows in the normal way to enquire as to his availability to give an expert opinion," it said. "Sir Robin accepted those instructions on 21 January 2013. "Sir Robin's role is entirely unrelated to his judgment in the Court of Appeal given on 18 October 2012 in the case of Samsung Electronics (UK) Ltd and Apple Inc. The instruction does not relate to any UK litigation or advice of any kind. Sir Robin is being remunerated for providing his expert opinion at his usual rates." The Japanese case dates back to 2011 when Samsung filed a claim that Apple had use one of its data transmission techniques without paying a licence fee. Apple had counterclaimed that Samsung had no right to the technology and therefore did not deserve a fee. Had Apple lost it could potentially have been banned from selling some of its older handsets in Japan. However, the Tokyo District Court sided with the Cupertino-headquartered firm. Samsung has filed more than two dozen claims that Apple has infringed its patents over recent years. But according to consultant Florian Mueller - who follows the sector - it has only been successful three times: twice in South Korea and once in the Netherlands. Its actions have, however, prompted investigations by South Korean, US and European regulators over allegations that it has been too aggressive in defending its rights. Apple won a major intellectual property case against Samsung in California last year where a jury awarded it $1.05bn (£650m) in damages. However, the American company has also had its share of legal failures including Tokyo District Court rejecting its claim that Samsung had infringed a patent detailing a way for smartphones to synch music with computers. News that Samsung was being aided by Sir Robin was revealed on Mr Mueller's Foss Patents blog. He noted that documents released by the US's International Trade Commission stated that the UK-based professor was "working on behalf" of three Samsung divisions in a dispute involving its tablet computers, media player and televisions. Mr Mueller - who has himself served as a consultant to Oracle in a case against Android-maker Google - suggested that it "just doesn't feel right" bearing in mind that Sir Robin had dealt "Samsung's number one rival a huge PR blow" in November. There is no suggestion that anything illegal or in breach of any rules has occurred - a point Mr Mueller acknowledges. When contacted by the BBC, Samsung noted that it had not directly employed the professor. "A highly reputed intellectual property expert and academic, Sir Robin has been contracted as an expert by a law firm that represents Samsung Electronics in its case against Ericsson," it said. UCL said Sir Robin was currently in Australia and could not be reached for comment. However, the law firm that hired him - Bristows - said there was nothing untoward about its move. "I certainly don't think it's unusual," said Myles Jelf, a partner in the firm. "I can't see that there's any connection in what Robin did or said in the case against Apple for designs that is at all relevant to him being asked for his opinion about patent law in a dispute against another party. "There was nothing untoward about the approach - there was no approach when he was involved in the Apple dispute. He would have had no inkling or concept at the time that he was saying those things in relation to Apple that Samsung were remotely interested in talking to him." But another intellectual property lawyer suggested that the news might raise eyebrows in the profession. "Robin Jacob is an internationally recognised intellectual property judge of high repute, and I am sure he would have considered the implications of his stepping back into the arena in this way, especially where it appears to be on behalf of someone to whom he recently handed a major victory across Europe to defeat Apple in the iPad wars," said Jonathan Radcliffe, a partner at Mayer Brown International. "It is a bold step that will prompt a debate on what exactly judicial independence means and how long it lasts. "This is a highly unusual move - retired English judges have hitherto confined themselves in retirement to sitting as a mediator/arbitrator and sometimes giving opinions on points of law."